Knoxville, Tenn. – Jan. 4, 2012 – Not all bowriders are created equal. 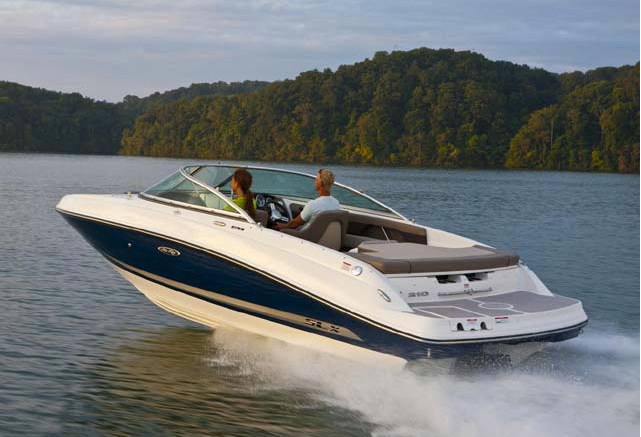 Case in point: Sea Ray’s luxurious SLX series. These five boats ranging in length from 21 to 30 feet include deluxe features such as premium soft-touch dashboards with double-top stitching, treatments in wood, SmartCraft® diagnostic instrumentation, and chrome switches and levers. And that’s just their helms! Thrilling performance comes from powerful MerCruiser® engines and precision deep-V hulls. Simply put, these exceptional sport boats are made to enhance the owner’s image as well as their confidence and enjoyment on the water. Replacing the previous 210 SLX, Sea Ray’s new 210 SLX model fits right into the fleet. It comes with impressive standard appointments, a meticulously crafted interior and sleek external styling — creating a dynamic mix of form and function. Take, for example, the deep, roomy bow area with plush cushions that are hinged to allow for noticeable convenience when accessing or stowing gear. The floor here and in the cockpit is finished fiberglass for enhanced structural integrity and longevity, and snap-in carpeting comes standard. Watersports enthusiasts will love the lockable wakeboard locker with vinyl matting and a gas-assisted lid, as well as the optional forward-facing, folding tower with integrated bimini top and anchor light. Because no two owners use their boat in the same way, the 210 SLX offers a choice of two distinct cockpit configurations, each with attractive, comfort-conscious accoutrements. Standard is a motorbox flanked by jump seats and backed by a sun pad. A popular option is a large sun pad lounger with starboard side walk-thru. Owners also get a choice of interior color schemes — chocolate/taupe (standard) or taupe/white (optional) — which incorporate elegant two-tone vinyl and color-matched accents throughout. Either interior layout is ideal for basking in the warm sun or chilling out at water’s edge using the integrated/extended swim platform with stainless-steel swim ladder and optional SeaDek® padding.